The final day of Brett Kavanaugh’s appearance before the Senate Judiciary Committee as a Supreme Court nominee began with fireworks as Democrats on the committee rebelled against restrictions on documents from the nominee’s White House years. 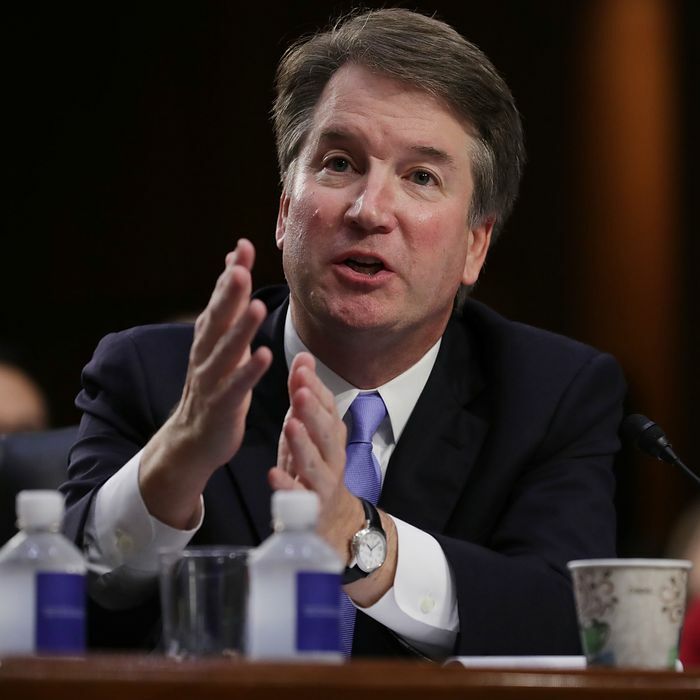 But it soon settled down into a fairly redundant pattern of Democrats promoting doubts about Kavanaugh’s independence from the president, his deference to progressive judicial precedents, and his overall stance on important issues ranging from abortion to guns to the regulation of corporations. Republicans defended the nominee, offered him softball questions, and sometimes attacked Democrats, relying on a general strategy of treating Kavanaugh as a non-controversial mainstream jurist that only wild-eyed lefties could hate or fear. Democrats continued to provide a fairly long list of judicial opinions, articles, speeches, and emails (these last from his Bush administration years) that fed critics’ convictions that Kavanaugh, like Neil Gorsuch before him, will be a black-robed wolf adept at wearing sheep’s clothing in settings like this hearing. Occasionally it looked as if they might do some serious damage to him, like when Kamala Harris hinted she had evidence that he had discussed the Mueller investigation with someone at the law firm representing Donald Trump (if she does, she hasn’t produced it yet). But nothing happened at the hearings that is likely to shake loose the two Republican votes that will be necessary to defeat his confirmation on the Senate floor (or perhaps more if any red-state Democrats vote for him). To that extent, the hearings were a victory — highly predictable, but a victory nonetheless — for Kavanaugh, Trump, and the GOP. But politically, the win wasn’t so clear. This is already an unpopular nomination, according to polls. And Kavanaugh will pay a price among people who actually followed the hearing for his constant evasions of questions about hot-button issues. Yes, he was citing a traditional principle of SCOTUS nominees in declining to answer questions about specific issues that might come up in future cases. But he cited it so very many times that he sometimes seemed like a criminal defendant taking the Fifth again and again. He also refused to express an opinion on many past SCOTUS decisions, and even declined to follow Justice Gorsuch’s mild criticism of the president’s unprecedented judge-baiting on grounds that it would be “political” (perhaps this was wise since Trump reportedly considered rescinding his first SCOTUS pick’s nomination after that criticism). In the end, Kavanaugh has been tainted by the character and behavior of the president who appointed him as part of a highly transactional deal with conservative Evangelicals and “movement” conservatives who are willing to put up with this president in exchange for shaping constitutional law for a generation. In the end, all the things Kavanaugh tried to conceal about what he would do on the Court have almost certainly been revealed by the careful and highly ideological vetting process that selected him, based in turn by conservative fury at past Republican-appointed justices who turned out to be unreliable. For those who think lifetime SCOTUS nominations are simply the spoils of presidential election victories, and that anyone Trump chose who meets minimal professional qualifications should be confirmed, Kavanaugh is a slam dunk. But Kavanaugh, Democrats, and Trump himself have raised multiple concerns about what his ascension to the Supreme Court will actually mean for the Constitution and for vulnerable people who rely on its protections. The Judiciary Committee will now hear “outside” witnesses on the confirmation of Kavanaugh ,and has scheduled a final vote on the confirmation for September 20, with the full Senate vote due to happen in the next week. It could be a fateful decision.